Heat oven to 350 degrees. Cut off the stem and part of the top of the bell peppers to form a cup. Scrape out the seeds and ribs. Using a 12-cup muffin tin, place 1 Tablespoon of water in 8 of the cups. 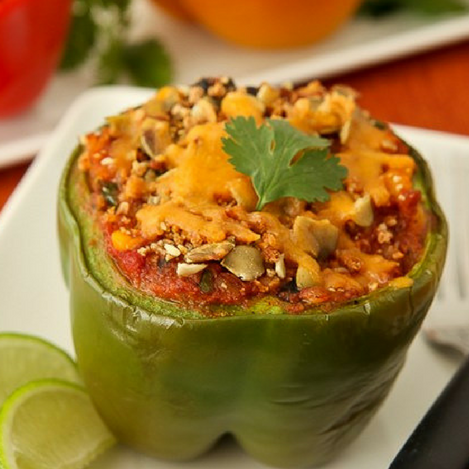 Place a bell pepper cup on top of each cup filled with water; set aside. For Filling: In a large mixing bowl, stir together all filling ingredients and mix well. Spoon and pack in filling mixture into each bell pepper cup; set aside. For Topping: Place Grape-Nuts and pumpkin seeds in a plastic sealable bag; seal bag shut. Using a rolling pin, coarsely crush the cereal and seeds. Sprinkle each pepper evenly with the mixture. Bake peppers for 40 minutes, then remove from oven and top each with some grated cheddar cheese. Return to oven for 4-5 minutes or until cheese melts. Carefully remove peppers from muffin cups and serve. Serves 8. If there is any leftover filling, it’s great as a stuffing for enchiladas, burritos, or quesadillas.